The Endurance 10 watt+ (10000 mW) diode laser add-on for 3D printer / CNC mill. Better engraving on anodized aluminum, stainless steel, copper & brass. Do you want to do laser cutting and laser engraving? Get an incredible experience with an Endurance 10 watt+ laser add-on. Engrave on metal, wood, plywood. Cut wood, plywood and acrylic up to 8-10 mm thick as if with a CO2 laser. №1 customer support for all newbies. To prepare a g-code use Endurance plugins or the T2Laser software. Buy the "invincible plus" powerful 10 watt+ (10000 mW) laser right now! The 10Watt Plus Laser has all the items needed to upgrade your Elekmaker A3 or 3D printer. I have both, but chose to upgrade my A3. Awesome power – this thing speeds up any laser project. I have gotten very detailed raster and vector images made with it. The control box is genius as it allows for some much visibility into the operations that you normally would not see with any other LED laser! I had 2 lasers before from China. One was 150mW and the other 15W. First of all, I’d like to start by saying thank you to George from Endurance Lasers, he has been an absolutely massive help and answered any questions I had. Best of all he replies quickly, within minutes usually! Which is insane, I have never had such amazing customer service before. As for the laser, it is very well built and you can see the work and research that goes into making it. It’s easy to set up and very good at engraving wood materials, dark-colored acrylic and cutting black acrylic. Laser driver is one of the most important components in the laser module. Laser driver controls the voltage and the current that goes to the laser diode itself. It is important so that the laser driver sets and keeps the voltage and the current stable. It keeps the laser diode safe. TTL wire/wires are also added to the laser driver. With TTL (3.5-12V range) you may change laser power (duty ratio). For 10 watt+ laser module we use special tuned and setup step down (buck) DC/DC converters with a current stabilizer. A buck converter (step-down converter) is a DC-to-DC power converter which steps down voltage (while stepping up current) from its input (supply) to its output (laser diode). All Endurance drivers/laser control boards are very reliable and been tested before shipment. Laser box is an excellent add-on for you laser module. You may use the laser box as a laser driver/laser control board. It means that you may wire laser diode directly to the laser box output. What is so great about 10 watt+ laser? Compatible with any 3D printer / CNC mill. Опубликовано Sal Gironda Суббота, 9 марта 2019 г. Buy the “invincible plus” powerful 10 watt+ (10000 mW) laser right now! 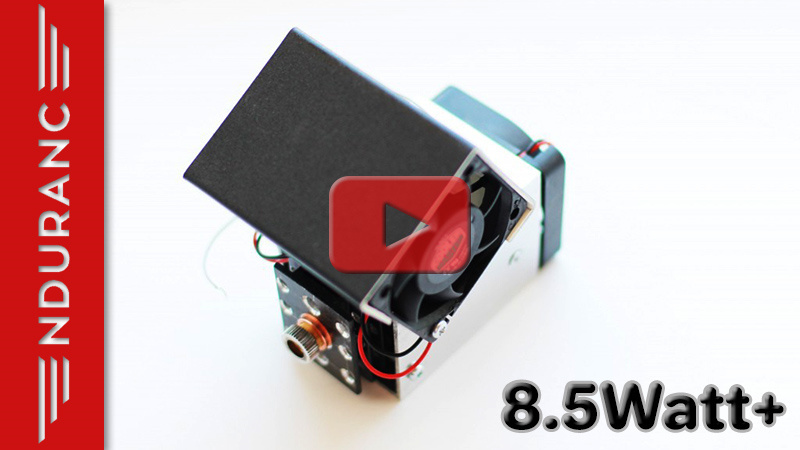 Endurance Presents A Brand New 10 Watt+ Diode Laser Upgrade For Your 3D printer & CNC Machine. The Endurance 10 watt+ “Invincible plus” was created by Endurance in August 2018. The laser is one of the most advanced diode (semiconductor) lasers on the market at the moment with a wavelength of 445 nm. Continious power. Efficient TEC cooling. Air assist. The 10-watt laser supports 9 – 24 volts. There is no need for additional power converters. – A laser box replaced a laser control board. – An advanced TEC cooling system. – A big focusing ring for easy focusing. A laser box allows to monitor the temperature, voltage and current of the laser diode. A TEC cooling system keeps the laser diode safe from overheating. A better heatsink surrounds the laser diode. A big focusing ring allows to setup focus with fewer steps and makes it more accurately. A polished aluminum housing of the laser looks good to the eye. What do you get in the parcel. The Endurance brand new 10 watt+ (10000 mW) solid-state (semiconductor) laser add-on for any 3D printer and CNC machine. Unlike most Chinese lasers and engraving machines an Endurance 10 watt+ laser can work continuously up to 48-72 hours. Has an extended lifetime of 10 000+ hours. The real rated optical power output is 10 watt (10000 mW). Got a question about our 10 watt+ laser attachment? You need 3 separate power adapters: 12V 5A for TEC cooling and the laser box + 12V 1A for the fans. Check the focus of the laser: tune the focus accurately for a G2 lens (optimal range is 6 mm [1/4'']) . Check the schematics of your electronic control board to connect the laser through the laser box (connect to the fan/spindle or laser pins). 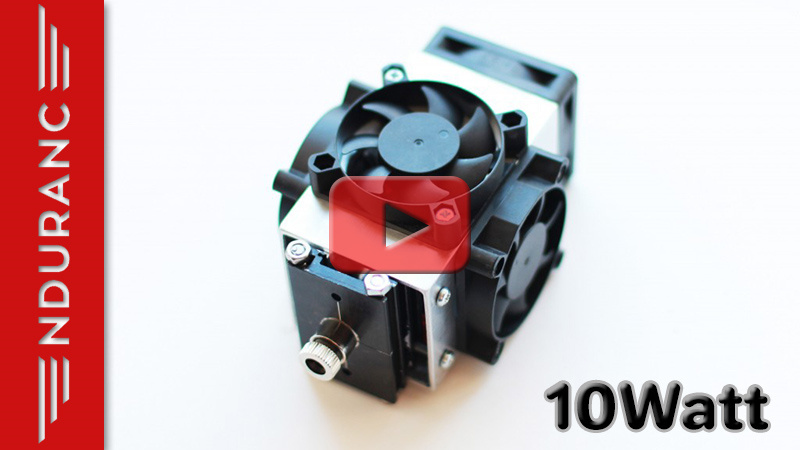 The Endurance 10-watt+ laser can be installed on any 3D printer and CNC mill.